Atlas release of 1:43 scale model of the Ferrari SF15-T F1 racing car. Mounted on an acrylic presentation base. Great gift for all F1 diecast car collections. Supplied by Atlas Editions. Accurate scale model Ferrari SF15-T.
F1 Ferrari F2004. Rubens Barrichello 2004. I am not 100% sure it is in the correct box but it is in a Ferrari F1 box. The car is good clean condition and has not been displayed. Atlas release of 1:43 scale model of the Ferrari F2002 F1 racing car. Mounted on an acrylic presentation base. Great gift for all F1 diecast car collections. Accurate scale model Ferrari F2002. Supplied by Atlas Editions. Marlboro white small Marlboro cockpit decals both sides. The exception is the engine cover decal which is designed to reshape the engine cover white area appropriate for the Marlboro decals. Marlboro rear wing decals top and underside. As driven during the 2018 season by Finnish Formula1™ Driver, Kimi Raikkonen. Bburago B18-36808R 1/43 F1™ Model. 2018 Ferrari SF71-H Formula1™ Car. The car carries his legendary Ferrari race number, '27'. The model is in mint condition, complete with plastic case, also in very good condition. FERRARI 550 MARANELLO. IN 1/18 SCALE MODEL. £20 REST OF WORLD. MAISTO MODELS. DUE TO POPULAR DEMAND I HAVE DECIDED TO LIST THIS MODEL AS A BUY IT NOW. SUPPLIED IN EXCELLENT - MINT CONDITION. PART OF A LARGE PREOWNED COLLECTION. FERRARI 126C2. POSSIBLE IXO / ALTAYA MODEL. DRIVER - MARIO ANDRETTI. 1982 F1 SEASON. FROM THE F1 COLLECTION. FREE MAGAZINE INCLUDED ISSUE 74. PART OF A FORTNIGHTLY COLLECTION SERIES . REST OF WORLD. £7.20. •Ferrari Spa ballpoint pen in Sheaffer Ferrari box. Fabulous promotional ballpoint Ferrari pen (with just a little mark on the lower black plastic). Both of these are great and look great together (note Ferrari Spa pen in Sheaffer box. ). Nicely detailed model by Looksmart of the Ferrari 458 Italia from 2009. The model is in excellent condition. The model is in its original box. Model LS 458D. 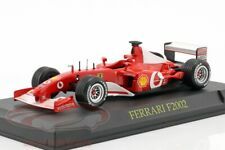 Atlas release of 1:43 scale model of the Ferrari F2008 F1 racing car. As driven by Felipe Massa in 2008. Mounted on an acrylic presentation base. Great gift for all F1 diecast car collections. Accurate scale model Ferrari F2008. Nice Quartzo 1:43 model of the Ferrari 312T driven to victory by Nicky Lauda at the 1976 Brazillian GP. Here we have a Hot Wheels F1 Ferrari. Formula One Diorama - 1:43 scale. Yes - I know it is a bit of a mix - modern grid base with 1961 Ferraris but hey. it looks good! 1 x Quartzo Q4153 1961 diecast Ferrari 156 #2 with Phil Hill in cockpit with display case. Superb 1:43 diecast model from Atlas in the "Ferrari F1 Collection". YOU ARE BUYING A LOTUS 79 MARIO ANDRETTI 1978 F1 CAR FROM THEFORMULA 1 CAR COLLECTION. NEW ON STAND WITH PLASTIC CASE, WITH MAGAZINE. Nicely detailed model by Looksmart of the Ferrari 458 Italia GT2.The model is in excellent condition and is mounted on a Schedoni leather base. The model is in its original box. Model LS 390C. Axel pins are in good condition. Vodaphone / Shell. Made by IXO. 1:43 scale. 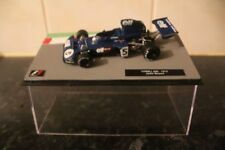 Onyx formula 1, 1 : 43 scale 1992 collection. Featuring 138 Ferrari f92a Ivan capelli. All ex shop stock. Happy to combine postage with my other listings where possible. The Ferrari F399 was the car with which the Ferrari team competed in the 1999 Formula One season. The F399 was almost identical to the previous season's F300 model, with small detail changes (new front wing, wheel tethers, waisted sidepods, an improved exhaust system and the use of Bridgestone tyres with four grooves instead of three). HOT WHEELS RACING 1/43 FERRARI F2000 MICHAEL SCHUMACHER F1 WORLD CHAMPION 26748. Condition is New. Dispatched with eBay delivery – Shutl 2-3 days. Nicely detailed model by Looksmart of the Ferrari 250 Nembo Coupe from 1966. The model is in excellent condition. The model is in its original box. Model LS 274A. Nicely detailed model by Looksmart of the Ferrari 599 GTO from 2010. The model is in excellent condition. The model is in its original box. Model LS 369G. Nicely detailed model by Looksmart of the Ferrari 599XX from the Geneva Motor Show 2009. The model is in excellent condition. The model is in its original box. Model LS 368E. TheFerrari F2004 was a highly successful Formula One racing car designed by Rory Byrne, Ross Brawn and Aldo Costa for the 2004 F1 season. It is one of the most dominant cars in the history of Formula One. 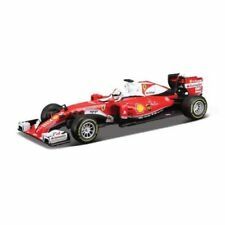 HOT WHEELS FERRARI F1-2000 SCALE 1:18 #26737. EDDIE IRVINE Hot wheels f1 car and a signed Ferrari baseball cap both in boxes, in very good condition. No. 28 car as driven by Didier Pironi. FERRARI 126 C2 - 1982. Made in 1:43 scale for Atlas Editions part no. Part of the Ferrari F1 Collection. 1/43 ELITE N5587. FERRARI F300. 1998 SILVERSTONE WINNER. Burago Diecast Model and plastic parts ages 3 . Good Quality Replica Die cast model. The model features Leclerc's Sauber C37 as it raced in Monaco, complete with revised aero on the monocoque, bargeboards and front wing. The model is limited to 680 pieces worldwide. His 2018 season had many highlights however, qualifying in the top 10 and scoring points in an unfancied car on several occasions, with a 6th place finish in Baku a season high, leading Ferrari to announce him as their second driver for the 2019 F1 season. BBR 1/18 scale, high-quality, resin models, faithfully reproduced in every detail. State of the art technology combined with the experience of BBR's handmade products ensures the very highest quality is achieved. 1975 F1 Clay Regazzoni Ferrari 312 B3 1:43 Scale. Condition is Used. Dispatched with Royal Mail 2nd Class. GILLES VILLENEUVE #27. 1982 FERRARI F126 C2. 1/43 Scale (Model = 10 cm approx. ). FERRARI F310, #1, Michael Schumacher, 1996!!! 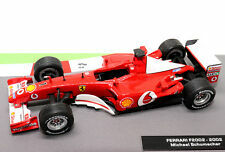 FERRARI F310, #1, Michael Schumacher, 1996 Launch Version, 1:64!! !